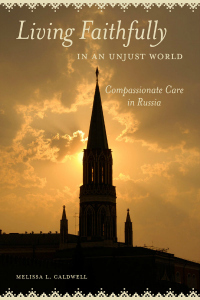 "How and why do people engage with social problems and injustices?” asks UC Santa Cruz anthropology professor Melissa Caldwell in her new book, Living Faithfully in an Unjust World: Compassionate Care in Russia (University of California Press, 2016). To find answers, Caldwell turned to Russia’s faith-based communities where she met people caring for some of Moscow’s most vulnerable populations. Caldwell describes how for many post-Soviet Russians, it was hard to adjust to the country’s political and economic transformation when the country dissolved in 1991. “My field notes from the 1990s and 2000s are filled with stories from friends and acquaintances who were frustrated by what seemed to them to be a dramatic rupture of the social compact that they believed previously knitted their society together,” she writes. Over the 20 years Caldwell has spent conducting ethnographic research in Russia, she has seen social welfare programs dissolve and neoliberal economic policies appear. This new political economy has made way for joblessness, homelessness, poverty, and intense socioeconomic stratification. In the absence of state-sponsored welfare programs, Caldwell found that members of faith-based communities have become de facto social workers: delivering meals, providing shelter, offering care, and giving counsel to those in need. Essentially, church organizations now provide the public service that the socialist state had previously filled. Caldwell introduces readers to a variety of individuals in Moscow, including Pastor Ivan, a minister at a Protestant congregation known for helping Russian orphans and prisoners. “Pastor Ivan reflected that in Moscow, there were many people who had realized that there was more to life than simply making money and they wanted to find ways to live meaningfully by helping others,” Caldwell shares. Caldwell found that the type of work faith-based communities engage in is a type of activism grounded not only in compassion and kindness but also social justice and humanitarianism. Moscow’s faith-based organizations must establish themselves as a religious community while also demonstrating they are more than religious and even non-religious, Caldwell says. She also found that many congregants worked or volunteered for social welfare projects across the city, and used the social hour after church services to find additional support and allies for their work. She also documented the extent to which many faith-based communities had close ties with international NGOs and humanitarian groups – connections that are often overlooked by critics of faith-based assistance programs but that are highly valued by international aid organizations and Russian government agencies and officials. For example, the minister and several staff members at the Christian Church of Moscow (CCM) underwent trainings sponsored by the United Nations High Commissioner for Refugees and the International Organization for Migration in order to work with asylum seekers who were hoping to gain refugee status and become eligible for resettlement. CCM eventually established its own NGO to administer these and other support services. “As a result of this added responsibility, the church’s social ministries had expanded beyond social services to include an explicit human rights dimension,” says Caldwell. For Pastor Mark, and others Caldwell encountered in Moscow’s faith-based communities, social work and spirituality intertwine: working with, through, and for each other. Faith is connected to civic life, and vice versa. Melissa Caldwell is also author of Dacha Idylls Living Organically in Russia's Countryside (University of California Press, 2011), Not by Bread Alone: Social Support in the New Russia (University of California Press, 2004), and Food and Everyday Life in the Postsocialist World (Indiana University Press, 2009). 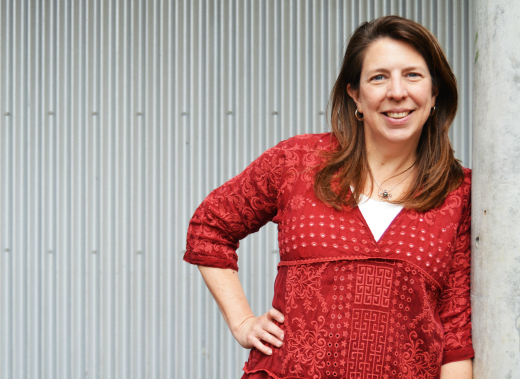 Since 2013, she has been the editor of Gastronomica: The Journal of Critical Food Studies. Her research interests include poverty and inequality, social justice, international development, anthropology of food, consumption, memory and trauma.